Tomatoes are rich in Vitamins & Minerals and helps in maintaining healthy skin. 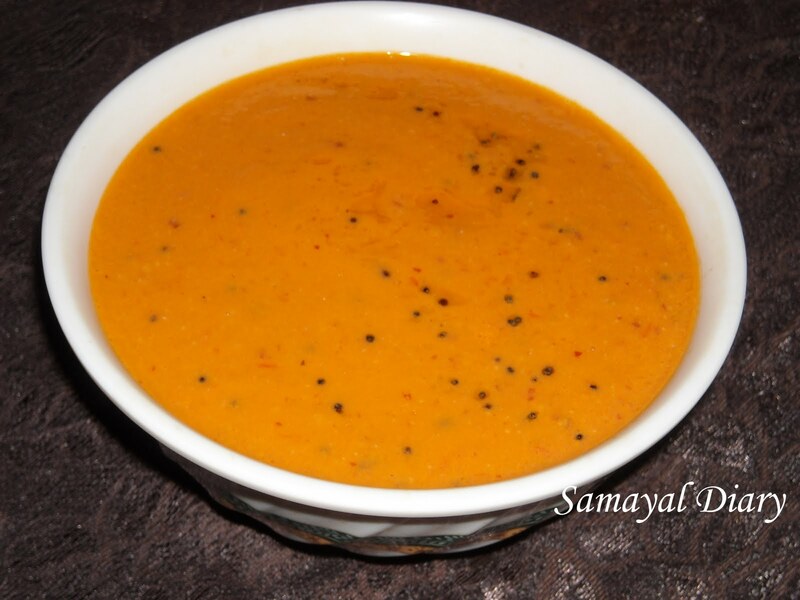 Tomato Chutney is prepared often in every Tamil Household apart from Coconut Chutney. My son likes anything prepared with Tomatoes and so I prepare this more often. Heat Oil in a pan. Add Channa Dhal and/or Urad Dhal. Few seconds later, add Dried Red Chillies and Garlic Cloves. Fry till they turn slightly brown. Now add chopped Tomatoes and Salt. Fry till the raw smell goes off and the Oil separates, say for about 10 mins. When cooled, grind to a smooth paste with enough water. Tomato - Onion Chutney can be prepared in the same method. Reduce Tomatoes to three and include 5-6 Pearl Onions.